Are you looking for the perfect Christmas, Mother’s Day, or birthday gift for women who love to bake? Here are my Top 15 gift ideas for bakers. I’ve included a range of holiday and birthday gifts for you to choose from, including luxury gift ideas if you’re shopping for that special present for your wife, fiancée or other woman in your life. These are great ideas for presents if you’re looking for more expensive gifts for your favorite ladies. I’ve also included some cool gifts for women when you’re buying gifts on a budget. These smaller gifts for bakers are sure to delight. I know I want a few of them! If you’re looking for a popular baking item for the women in your life, I’ve tried to include some ideas for presents for the woman who has everything. And if you’re shopping for a baker who is a daughter, mother, sister, in-law of any kind, grandma or even a Nana, she’ll like these gifts. If she likes to bake, and you surprise her with the perfect add-on to her baking tools collection, she is certain to find it thoughtful that you took the time to find her the perfect gift. If you’re in a hurry to shop, Click Here for the Best Baking Gifts on Amazon. In our review, you’ll see that the KitchenAid KP26M1XER Professional 600 Series 6-Quart Stand Mixer is a true baker’s stand mixer. With a 6 quart bowl to work in and a powerful 575-watt motor to drive its direct-drive transmission, this stand mixer is especially favored by bakers. KitchenAid has long since solved a problem it had with plastic gearboxes and this model comes with metal gearboxes standard since the spring of 2007. 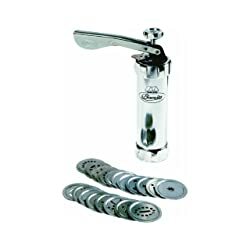 This particular model and size has over 3,260 reviews on Amazon, far more than any other mixer, and an average rating at this time of 4.3 out of 5 stars. With the spiral dough hook, flat beater, wire whip, and a single-piece pouring shield, your lady baker will have a solid baker’s stand mixer. And KitchenAid offers over 15 more optional attachments if she needs more flexibility. The bowl is a lift design bowl which is more ridged than a tilt head and this design allows for a stronger motor and the ability to add the spiral dough hook. Or, if you’re looking for something a little different, check out our stand mixer reviews here. 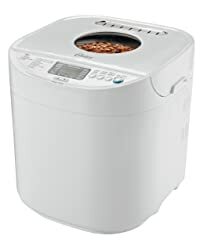 The Oster CKSTBRTW20 2-Pound Expressbake Breadmaker is an excellent choice of a breadmaker for a larger family, and can do up to a 2-pound loaf. Right now it’s the #1 Best Seller in Bread Machines on Amazon, with an average 4.3 rating and over 1,400 reviews. I recommended a different breadmaker last year (a Panasonic), but it didn’t do whole grain bread, and I decided to find a better model this year. The Expressbake has a 13-hour programmable baking timer, so once you’ve got your bread recipes down pat, you can set and forget and come back anytime you want to fresh bread. I also like the 9 different bread settings (up from 5 for last year’s recommendation) and 3 crust settings. Who wants boring looking bread? With a large LCD, you can see what stage the bread machine is in if you want to monitor its progress, and the Expressbake setting takes less than an hour to produce your loaf of bread. You can also work with dough or jam, although breads are my favorite. If you like to add nuts or fruits to your bread, there is an “add ingredient” tone to let you know when it’s time to act. Be sure to take the kneading paddle out of the bread right after you drop the loaf out on the table. Once removed, put in the bread pan but do not put in the kneading cylinder. The bread around the paddle is moist, and if it dries onto the cylinder, you may never get it off! The George Foreman GRP4EMB Black Evolve Grill comes with 2 removable grill plates, 1 deep-dish bake pan and 1 cupcake and muffin pan insert. The 84-inch grill surface makes for some true cooking space on a tabletop grill, and the nonstick coating allows you to cook without butter or oil if you want, and it truly does work. If you aren’t familiar with George Foreman grills in general, you’ll love these. They have removable grill plates that can be washed in the dishwasher and they are incredibly easy to clean, especially if you wipe them down while they’re cooling so junk doesn’t dry on and coat them. I LOVE my George Foreman Grill. They come with an adjustable slope to help keep the fat off the food, and it’s amazing how much healthier foods are when cooking with the fat or excess oils draining off. This tabletop grill is also designed especially for bakers and includes a 4-plate starter set (2 grill plates, 1 deep-dish bake pan and 1 cupcake and muffin pan insert). Easy to use to bake. Even easier to clean up. Best of all, you can use this for more than just baking. 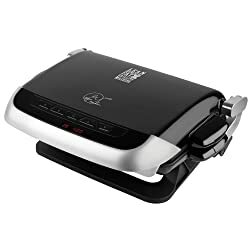 You can do all the normal indoor easy grilling, and you can also get other inserts like the omelet and snack plate set, a waffle plate set, a shallow griddle pan, and the mini burger insert. George Foreman grills are truly multi-functional appliances and well worth the counter space. My George Foreman grill is one of my most-prized kitchen appliances. What more could any women want &dash; easy to clean, does lots of different things, works specially for baking, and healthy cooking, too! Be sure to take a look at the Wilton 2109-0309 Ultimate Professional Cake Decorating Set. If the women in your life loves to bake cakes, then this is an essential tool for her. It has all of the essential tips, cutters, shaping tools, spatulas and more to give her the ability to create even better masterpieces than before. Indulge her passion for cake decorating and get her this ultimate set of cake tools for a Christmas gift. And of course you’ll be the wonderful person who gave her this useful cake decorating and baking set, so you should get to taste the results, right? Everything she’ll need to decorate a cake is available here. One caution — if your gift recipient is a beginner enthusiast to cake decorating, this set doesn’t come with a "how to use these tools " manual. My best recommendation is to get these three Wilton lesson books as well if she needs some guidance on how to get started. A few step-by-step instructions with pictures never hurts. Wilton Decorate Smart Ultimate Rolling Tool Caddy is my favorite choice for a decorating kit tool caddy. The wheels, in my opinion, make it more practical than a flat base kit that you have to migrate from place to place on your counters or find a place to store it. Most bakers like our tools organized, and this Wilton caddy is great for that. Four levels of drawers and compartments keep everything just so, and I really like the tip organizer because the tips are stored upright and easy to spot. If she’s been baking for long, she has probably already collected a considerable number of Wilton or other accessories to practice her baking hobby or avocation. 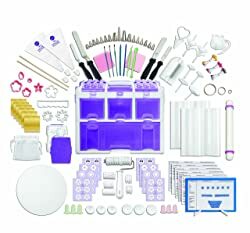 But if she hasn’t, you should also look at the Wilton Ultimate Professional Cake Decorating Set because it has a huge selection of all the basics a budding baker is going to want in her baking toolset. 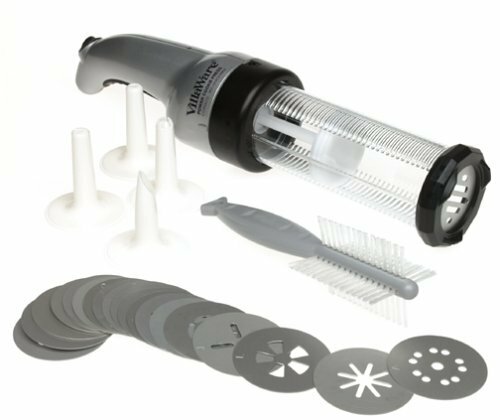 Chances are good that if you hover in the kitchen while she’s decorating or baking, you might spot some gaps in the tools she has available, and you can check out the Wilton options on Amazon for more choices. The Norpro 3301 Cookie Press makes dropping cookie dough a much easier proposition that my grandmother’s old “two-spoon” method. While I’m not going to claim that Grandma’s old methods are outdated — not if I ever want cookies in THIS family again — when you’ve got a lot of holiday cookies to bake or bake sale batches to prepare, something faster is a good thing. Plus I like the 24 different accessories to make pretty cookie shapes and decorations. You even get a recipe book and instructions in case you’re looking for some extra inspiration. Snow River 7V03152 18-Inch by 24-Inch by 3/4-Inch Embossed Pastry Boards are solid hardwood boards designed and premarked for bakers. 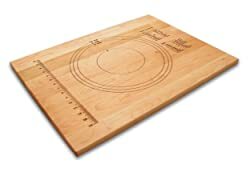 A lot of bakers work on a hardwood board for stability and a pre-marked board makes sizing and measuring far easier while you’re rolling out dough for pies, phyllo dough, biscuits, or pastries. The pastry board is crafted to ensure consistent moisture content to avoid cracking or splitting, so your baker will have this pastry board for a long time to come. There’s also a nice weights, measurements, and liquids conversion chart for those of us who can never remember how tablespoons translate to cups and back. A VillaWare V5375 Power Cookie Press is a great holiday gift, birthday present, wedding present, or engagement gift for a baker, especially if she’s big on cookies! It’s electric, cordless, and rechargeable, so this will definitely appeal to us ladies who like kitchen gadgets. (Hand raising here). It also comes with both everyday and holiday discs to create beautiful decorative (and tasty) cookies any time of the year. The one reviewer so far says that she can manage 5 to 7 dozen cookies pressed out within about 1.5 hours. Compare that to Grandma’s spoons! Unfortunately, as of December 27, 2015, this is out of stock at Amazon. I’ll keep you posted when it comes back in stock, and if you really like it and are in a hurry, I left the link to Amazon live so you can click and check any time you’d like. So I’ve added another cookie press here as an alternate gift idea for you for #8. 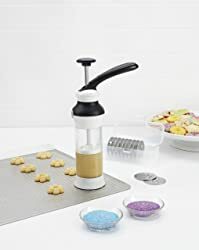 A OXO Good Grips Cookie Press is a great holiday gift, birthday present, wedding present, or engagement gift for a baker, especially if she loves to bake cookies! This is the #1 Best Seller in Cookie Presses on Amazon, with over 350 reviews. In addition to the cookie press itself, you can also buy spring, autumn, and Christmas add-on disk sets so she can create yummy cookies all year long. 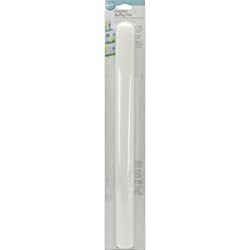 Wilton’s Fondant 20 Inch Rolling Pin is a solid choice for a baker’s rolling pin. Unlike most pie and pastry rolling pins, larger sheets of fondant sometimes need some extra handling capacity. This 20-inch smooth and extra wide rolling pin can roll out a beautiful piece of fondant, especially if you add the separately available rings. Because there are no handles, the rolling surface doesn’t taper, and your baker has use of the full length of the fondant rolling pin. Its non-stick surface easily serves to lift and cover your cakes with the fondant sheet as well. While you’ll get the best benefit from working with your cakes and fondant, it works well for pies and pastry, too. Some reviewers felt that it was harder on the hands to use, but others found it easier to use because it was heavier and worked well with the measuring rings. 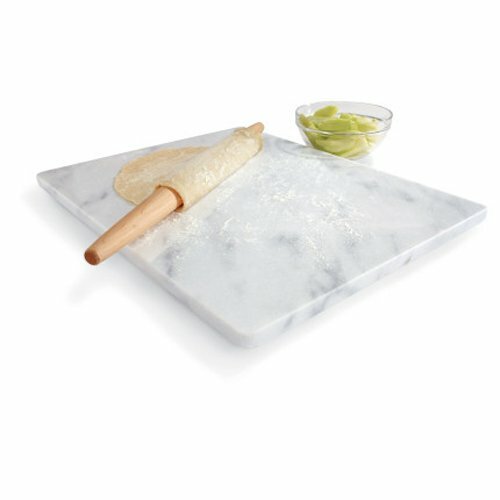 This Sur La Table White Marble Pastry Board HK165-50 is a formidable 16×20 inch working surface for all of your baker’s pastry board needs. If your baker is working with tart shells or any other butter-based pastries, they need to maintain the dough’s consistency and keep cold butter bits intact so the dough can create essential flakiness. Just working with refrigerated dough won’t cut it because the rolling pin and board create friction and heat while working with the dough. If the butter bits aren’t cold enough, the dough won’t be its best, and the natural coolness of the marble in this pastry board helps reduce issues with melting. Wilton’s Tilt N Turn Ultra Cake Turntable gives bakers the best of both worlds with its ability to both rotate cakes for decorating around the sides and also tilt cakes to better reach different surfaces. Cake decorating is precise work and takes a steady hand to make beautiful baked art. The non-slip design and balanced base weight helps hold the plate surface securely, and the rotating top plate rotates in either direction for left-handed use or right-handed manipulation. While working on a section, a baker can lock it down, and the 18 different plate tilt positions are also secure. The Wilton Tilt N Turn Ultra is taller than many compact turntables used in cake design at 5 inches, and the plate is 12 inches in diameters, so it can hold a larger cake comfortably. Best of all, Amazon users rate it currently at 4.9 out of 5 Stars, which is an incredible rating. 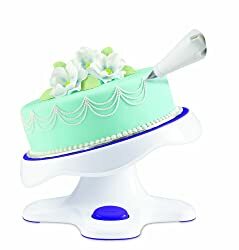 Reviewers rave about how stable and useful it is, and wonder how they ever got along with other cake stands and cake decorating turntables before. How much can you say about a cookie spatula? Normally not much, although this pretty dude does come in blue, green, red, and grey/black. 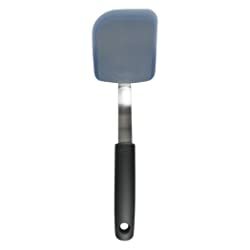 However, OXO makes an incredible kitchen utensil, with the best comfortable grips I’ve ever found on any spatula, spoon, or turner. And I started with silicone kitchen gadgets several years ago and I’ll never go back. They’re basically non-stick, and the utensils don’t heat up when you leave them touching a pan or pot, and that’s a major blessing. Plus the silicone surface doesn’t hurt your pots and pans when you scuff along or scrape them along the bottom or sides to scoop, loosen, or lift things. So I guess there’s a lot you can say about a cookie spatula, at least one with as good a grip and as useful a surface as Oxo’s ones. 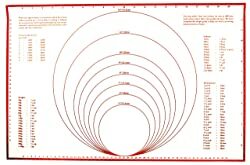 Fox Run Silicone Baking Mats with Measurements are a wonderful addition to any baker’s kitchen, especially if she struggles with space issues because it can be rolled or stored flat. She can use it in all oven types and it provides a wonderful heat distribution for baked goods. There are metric to Imperial weight and measure conversions if your baker needs them, but I think its best features are the fact that it rolls up to store away, and the silicone mat is both stain-proof and resistant to “stuff” sticking on it. To clean it, it just needs to be wiped down with a damp, soft sponge and warm water, and only needs some soap in extreme cases. However, this mat isn’t good for cutting or scraping dough because it will damage the silicone surface. It also shouldn’t be used under a broiler or on a grill. But for a baker to use in creating even, well-baked goods, it is a nice kitchen baking tool. 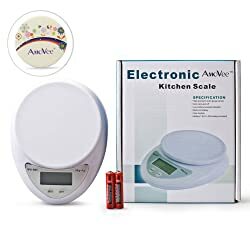 The AmoVee Professional 11lbs/5000g Compact Digital Food Scale Baking Scale doesn’t take up a lot of room in your kitchen, and it serves as a general kitchen and food scale. It’s also accurate and precise enough for baking enthusiasts down to 0.1oz or 1 gram, and can manage 11 lbs or 5kg without problems. I love the tare and auto-off features. I can’t stand messing with a scale to zero it out. And you’re safe wherever your baker lives or bakes. It will do grams, pounds, and ounces for weighing or conversion. Normally inexpensive products like this turn out to be somewhat cheap in manufacture or quality, but despite the price, this scale appears to perform much better than reviewers expected. Just keep in mind that this is a “compact” scale. If the baker in your life needs one for measuring large containers, it might be too small for that. 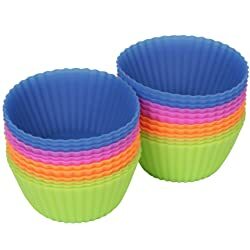 #1 Rated Silicone Baking Cups and Cupcake Liners are an incredible holiday present for any baker. I’ve got them on my Christmas present list, too. No more messy paper baking cups again. They are made of BPA-free, FDA approved, Eco-friendly, and non-stick silicone. And because they are flexible, it’s incredibly easy to get baked treats out of them. They’re oven, microwave, and dishwasher safe for easy use. With reusable silicone baking cups, bakers won’t have to hassle with muffin tins or cupcake papers, and they’ll go right on a baking sheet into the oven. And I’ve got my eye on them for some of the other suggestions they mention — Ice-cream desserts, cheesecakes, gelatin, and gooey chocolate-lined desserts. I can’t wait to get mine for Christmas. Sadly enough, we can’t include every possible fabulous baker’s product here to choose from, but these should be a good start for you to help pick out a wonderful present for the women in your life who bake. Whether you’re shopping for a girlfriend, wife, sister, mother, mother-in-law or sister-in-law, or other family member or friend, if she loves to bake, she’s sure to find something on this page a wonderful gift under the tree. So happy shopping, and hopefully our holiday gift guide for women who love to bake will help you make the cooks in your life happy this Christmas and all year round. What do the bakers in your life enjoy making most? Cookies, cakes, breads, pastries... What treats do you get to enjoy most often? 9 Responses to "Top 15 Best Christmas Gift Ideas for Women Who Love to Bake"
My mom would love that mixer. It looks amazing! Great page! Now I need to head off and check out what I have so I can fill in the rest! Thanks for giving me ideas to slip to my hubby this year! What about men who like to bake????? I have another page on Cook’s Measure here with gift ideas for men and we’ve got some baking gifts there, too. I do know a woman that loves baking and I think those would be great products in her kitchen. 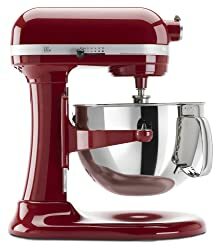 I’ve been drooling over a Kitchen Aid for years, but don’t currently have room in my kitchen (or spare funds!) The ultimate decorating kit looks incredible! The cake slicing kit is on my list to buy for Christmas. A great set of gifts for bakers! You have so many great ideas here. Top suggestions Susan Davis!! Thanks for your awesome collections.Idea No #9 is really fabulous. Wish to buy one ASAP.thanks Again..
And to think I was going to talk to sooemne in person about this.